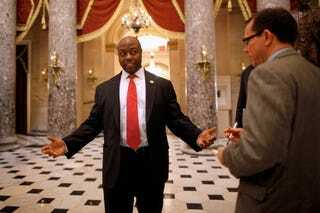 Who Is Incoming Sen. Tim Scott? (The Root) — Practically overnight, Rep. Tim Scott has been catapulted from being just one of the hundreds of nationally unknown members of Congress to one of the most recognizable and influential politicians in the nation. With his appointment by South Carolina Gov. Nikki Haley to replace Sen. Jim DeMint in January, Scott will become the only African American in the Senate, and as such the second-most-influential black elected political leader in the land behind President Obama. Adding to Scott's potential star power and influence is the fact that he is a conservative Republican when there are very few notable GOP faces that are black, especially in Congress. But unlike outgoing fellow African-American Republican Rep. Allen West (who gained notoriety for controversial statements), Scott is, in many ways, an unknown entity. He has kept a lower media profile than West during his first term in office, a strategy that appears to have served him well. Below, a look at some quick facts about the nation's newest senator-to-be. 1. He defeated the son of one of the country's most famous segregationists on his journey to Congress. To win the Republican nomination for his congressional seat, Scott went up against Councilman Paul Thurmond, son of legendary Sen. Strom Thurmond. The senior Thurmond was best known for serving nearly half a century in the Senate and spending much of his early career as the nation's most notorious segregationist (who secretly fathered a black daughter). Scott beat Paul Thurmond in a runoff, in part by out-fundraising him, but in part by securing the support of high-profile conservatives with national followings — among them Sarah Palin, Karl Rove and Mike Huckabee, all of whom apparently identified Scott as a rising star early on. Looks as if they were right. 2. He declined to join the Congressional Black Caucus. Defining his politics as colorblind, Scott had this to say about joining the caucus of African-American lawmakers: "While I recognize the efforts of the CBC and appreciate their invitation for me to caucus with them, I will not be joining at this time." Added Scott, "My campaign was never about race." This shouldn't come as a particular shock to anyone who viewed his campaign ads, which didn't feature a single person of color besides him. 3. He made his name opposing "Obamacare." Scott gained notoriety in his home state in part by drafting the first bill challenging "Obamacare," the law also known as the Affordable Care Act. The move helped seal his conservative bona fides, so much so that Scott made the bill a centerpiece of one of his first television ads in his congressional run. 4. He opposed the Justice Department's efforts to increase diversity among South Carolina's elected officials. In the closing days of the Clinton administration, the Justice Department filed suit challenging Charleston County, S.C.'s at-large voting system. Instead of being elected by individual districts, county council members were elected via an at-large system. This meant that even though African Americans made up a third of the county, council representatives were rarely people of color and were usually Republicans. 5. He is a major foe of organized labor. Right-to-work laws have been thrust back into the spotlight, thanks to legislation recently signed into law by Michigan Gov. Rick Snyder. Part of the reason Scott has become a darling of Tea Party conservatives is his vocal support of South Carolina's right-to-work statutes, which make it nearly impossible for unions to collect dues and organize.